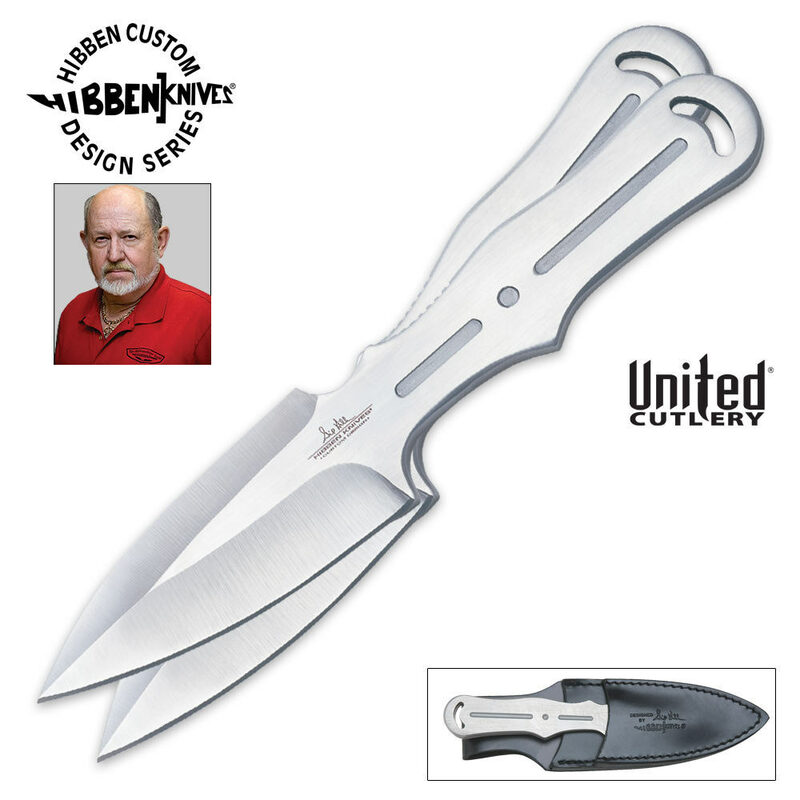 Gil Hibben – Two Pc. Professional Grade Throwing Knife Set 8.25 In. Designed with the professional knife thrower in mind, these 8.25" stainless steel throwing knives are 1/8 of an inch thick with the ideal proportion and weight distribution required of professionals. Although these knives have a professional design, they are also a great selection for beginner throwers who are still honing their skills. The cut-out designs help these aerodynamic throwers fly right into your target. Includes a leather sheath. I generally throw real knives, not throwing knives. I got two sets (a total of 4 knives) for my son to join me in the weekend card game. As for throwing knives, I prefer asymmetrically shaped knives meaning a single edge design such as Gil Hibben's Original Large Triple throwers and the Large Tanto set. While these knives are technically asymmetrical, they are for most part symmetrical and therefore good for beginner. As expected, these throwers rotate consistently making perfect horizontal handle strike without much efforts. For a relatively light thrower, it hits quite hard. It digs almost an inch deep into soft pine wood. Throwing from the handle 12 feet away, my son had no problem cutting a playing card with three knives without hitting any of the knives. I would have rated it 5 stars if they were bigger and heavier like the old 15" thrower Gil Hibben used to sell twenty years ago. These are two of my favorite throwers. Good balance. Good weight. Sharp blades. I have thown these hundreds of time at wood trees etc. They have fallen to pavement before. They are still in tact. Minimal ware.